Paddington was recorded as Padintune in 959 and the name is derived from the personal name of the Saxon Padda and the Old English tun, 'a farm - it means 'the farm of Padda', an Anglo Saxon chieftain. Recorded as Patyngton in 1398 and changed to Paddington in the course of time. 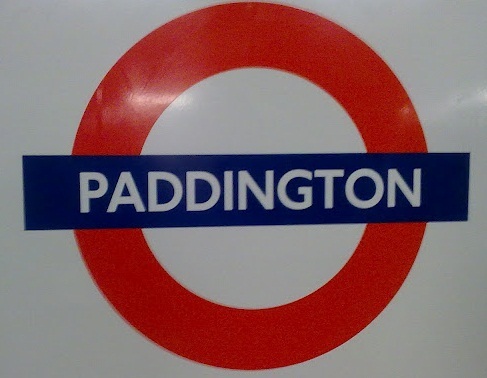 The Circle Line station (opposite The Great Western Station Hotel) was opened as PADDINGTON (PRAED STREET) on 1 October 1868; re-named PADDINGTON 11 July 1948. The Hammersmith & City Line station (alongside the main line platform 12) was opened as PADDINGTON (BISHOP'S ROAD) on 10 January 1863; re¬named PADDINGTON on 10 September 1933. The Bakerloo Line station was opened as PADDINGTON on 1 December 1913.